Announcements is a Telzio feature found in Call Flows that enables you to create a custom message for callers to hear, such as news you want to promote, or an out-of-office message. You can easily customize Announcements for various purposes using Call Flows. For example, you can add an Announcement as an option in the phone menu, or as an on-hold message while callers wait to be connected. In this article, we’ll go over a few examples of how businesses are using Announcements with their Telzio phone system. Flexible plans and easy configuration enable marketers to set up campaigns that engage people via toll free numbers and creative announcements. For example, you can incorporate a phone number to promote the release of a new song, TV show, or product release. 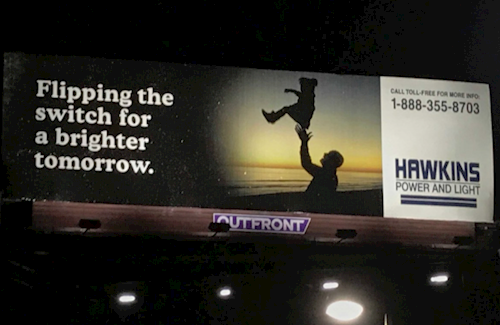 When Netflix was promoting the second season of Stranger Things, they used Telzio to power a phone number for Hawkins Lab, which was posted on Billboards across Los Angeles and New York. Viewers were able to call in and hear an announcement from Dr. Sam Owens, along with clues about the upcoming season. When Travis Scott was promoting the release of his song Pick up the phone, he purchased a toll free number from Telzio to engage with his fans. Upon calling the number, fans would hear the soon-to-be-released song. The vanity number was blasted out to his millions of social media followers, inviting them to call in. Occasionally, the number was re-routed to the artist, and lucky fans were elated when Travis Scott actually picked up the phone. Announcements can be added to a hotline to provide information, instructions, education, and even a fortune reading. Using the pay-by-phone feature, these informational announcements can even require payment before allowing callers to hear the information. Escape My Room uses announcements to create stories and entertain guests, even before they arrive. While Announcements are more straightforward, IVR Menus can also be used to make the greetings more interactive. an alternative way for callers to contact you. During holidays and after hours, you can play an out-of-office message as an alternative to the traditional option of leaving a voicemail. Using other features in the Call Flow like SMS, Transfer, or Voicemail, you can set up more routing options for an after hours schedule.